denv.her. was invited to the one year anniversary of Bamboo Sushi 's opening in LoHi! #YASplease. 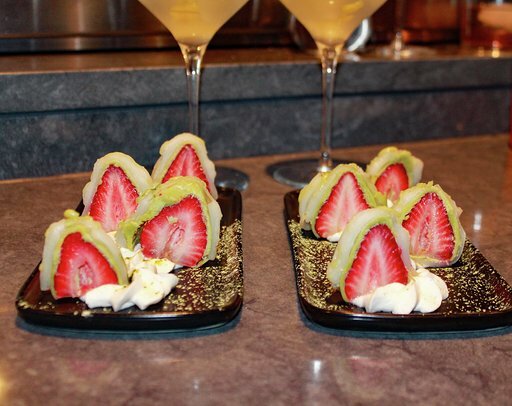 To celebrate, they had a special seven course dinner with alcohol pairings - we could not wait to get down on their Sushi and Japanese plates. We were seated at Bamboo's sushi bar where we were able to creep on all the yummy sushi being made and plated while we waited to be served. 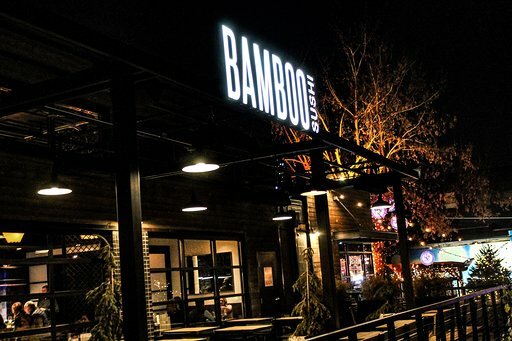 Bamboo’s staff was friendly and attentive throughout the entire meal! First Course: Jidori Su-Pu-Onsen Tamago, Takenoko, Enoki Mushrooms. Starting off with a bang! This soup was a winner - similar (but more elegant) to hot and sour soup with a lightly poached egg in the middle. We cracked open our egg yolks and mixed it in with our soup - so yum. The Tamago was paired with Ume Carré which is a combination of Sensei Japanese Whiskey, Akashi Ume Whisky, and Bordeaux Cherry. I am not a big brown liquor fan but the whiskey went nicely with the soup. We got to interact with the head chef, Blayne Ochoa throughout the dinner and he gave an overview of each dish to us. Chef Blayne let us know that ankimo sashimi, is Monkfish liver. We had never tried this before but it was delicious - albeit the texture was interesting haha. The sweetness of the candied persimmon and the richness of the miso butter complemented this sashimi perfectly! & don’t even get me started on the miso butter #NOM. This course was paired with the Crossings Sauvignon Blanc. Sauv Blanc is always a favorite of ours - crisp and refreshing! Three different types of sashimi with different “condiments” (literal definition of Yakumi). First up was the Big Eye Tuna with Pomegranate Whiskey Shoyu. Second was the Kanpachi with Yuzu juice, preserved walnut and sea salt (this was my second favorite - so tasty). And finally the Aji with Tosa soy, Yuzu Kosho, and Shishito Pesto. The third combination with the shishito was Treslyn's favorite out of the entire meal! I am a sucker for tuna sashimi so I have to say that the Big Eye Tuna was my favorite out of the three of these but ALL three were delicious. This course was paired with our first Saké of the evening, a Bamboo Saké. Nice, smooth and standard. The presentation of this dish was beautiful. The light and flaky Rockfish was perched on a bed of greens and accented by the brightly colored ginger chimichurri. The fish was v fresh but a bit bland - not my favorite dish of the night but still ok! The rockfish was paired with a Saké called Kanbara “Bride of Fox.” This Saké had a slightly drier taste and went well with the light flavoring of the Rockfish. These fresh AF oysters arrived resting on purple daikon with a cracked wasabi visible. The granita, or shaved ice, helped to keep the oysters nice and chilly. These oysters were the real deal - so fresh and with high salinity - just how I like em'! First was the Ora King Salmon topped with pumpkin miso and dehydrated gochujang crumble - this flavor combination - 10/10. This was Treslyn's favorite of these three. Second was the East Coast Crab topped with shiso crème fraiche and Oscietra caviar - just have to pause for a moment to comment on the buttery-ness of this crab and smooth crème fraiche. Like holy cow, unbelievably good and this had to be my fav out of the entire meal. The third piece of sashimi was a Santa Barbara Uni-Fried Shiso Leaf with Kombu Soy and house cured ikura. We had never tried Uni before and this piece had a v distinct taste that we enjoyed! The sushi was paired with the Bamboo cocktail called 'Rhymes with Sushi', which is a combination of Pisco, Aperol, Shiso, and ginger. This was paired with a Bamboo cocktail called The Color of Success, a concoction featuring Dolin Sweet Vermouth, God of Water Saké, and Yuzu Saké. WHAT A MEAL! Big thanks to Bamboo Sushi for having us! We can't wait to visit again soon! Happy eating Denverites!